Established in 1981, Poundstretcher is the UK’s leading variety discount retailer for quality food, toiletries, garden essentials and home-ware brands. With 400 stores nationwide, Poundstretcher offers shoppers an incredible selection of great value products at competitive prices, including kitchenware, bedding, bathroom items, furniture, electric goods, children’s toys and even pet care products within the brands “Pet Hut” section. 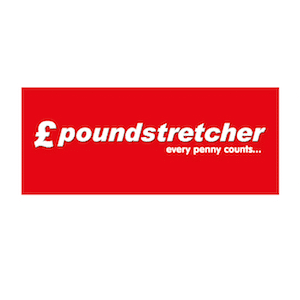 For money-conscious grocery shoppers, Poundstretcher also offers great value prices on everyday big brand items such as food, toiletries and household goods, along with a fantastic range of seasonal goods. With Poundstretcher, you can be confident that you are getting the best deals and making your budget go further without sacrificing on quality or style!